Dingsheng Tiangong Construction Machinery Co., Ltd (DSTG) is a professional motor grader manufacturer. It is the birth place of the first motor grader (1961) and NO. one brand in China, as well as one of the top three production bases of Motor Grader in the world. DSTG motor grader adopts advanced technology from Germany and its output power ranges from 120hps to 350hps. In fact, the largest output power motor graders in the world are our products. 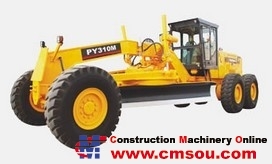 - It adopts Shangchai or Cummins engine which is specially designed for construction machinery. - Hangchi electro-hydraulic shift transmission. - There is the patented XCMG “no-spin differential” installed in the three-section type drive axle. - The flexible synchronization dual pump dual circuit hydraulic system , imported control valve. - Full hydraulic brake system, with imported brake valve and relief valve. - Full hydraulic front wheel steering, featuring small turning radius and flexibility. - The patented adjustment-free shovel rolling plate gear ring structure is the first choice for laser levelling device. - The cab is installed with French “F-green” glass which can prevent the ultraviolet ryas; and there is movable control console. - It can be operated by drivers of various body shapes. - The front frame is made by hot-forming in one time and numerical controlled welding, which is unique in the country. - The engine hood is of streamlined profile, which looks plain and beautiful. - The heavy duty blade can improve the service life by 100%. - 6 wheel drive motor grader, with the hydrostatic drive technology adopted in the front wheel, which improves the traction force. - It’s equipped with Shangchai engine which is specially made for construction machinery.